Available Literature For Your Chambers! © Originally copyrighted by the Chambers Corp. Unless you have the cookbook CHAMBERS published for your range (stove), you really cannot appreciate how wonderfully well these units cook! 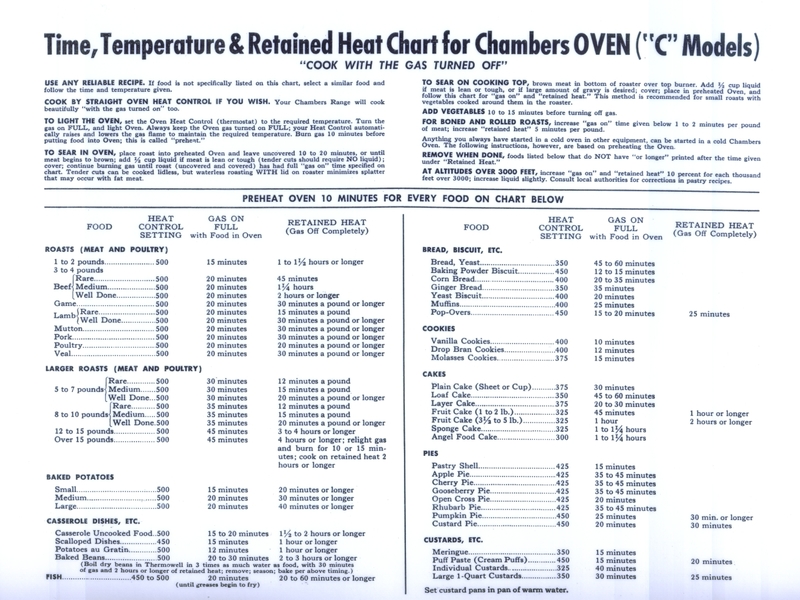 Many CHAMBERS owners have lost their original operating literature, including the cookbook, cooking chart, and canning guide. Some got their stove second-hand, only to find out it did not come with these items. 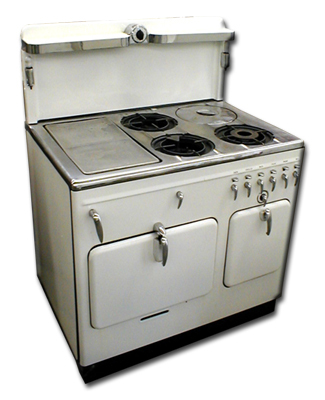 Not long ago, heard from a very nice lady in New York state who had been cooking on a CHAMBERS range for over 21 years, but had never cooked "with the gas turned off" - she was content to use it like any other stove (as if it were), but had no idea that her CHAMBERS was capable of SO MUCH MORE! She now has a cookbook, and is learning the joys of CHAMBERS cookery. Without the cookbook, cooking chart, and canning guide, you just don't know what you are missing! The other piece of literature that is essential to the CHAMBERS owner is the SERVICE MANUAL. It tells you how to calibrate, service, and repair you CHAMBERS, and is essential to making SURE your unit is operating properly! Scroll down to see what literature we have for your model. NOW YOU CAN ORDER DIRECTLY FROM THIS PAGE AND PAY USING PAYPAL WITHOUT HAVING TO EMAIL, CALL, OR MAIL IN YOUR PAYMENT! If you don't have a PayPal account, you can still pay using your credit or debit card as a PayPal Guest - simply click the "checkout" button on the Shopping Cart Page when you're finished ordering. If you do not want to use PayPal, that's fine, too! You can order using email or regular mail. 1. Pick out what items you want to order. 2. Click HERE to open an RTF version of the Literature Order Form. 3. Fill in the blanks on the Literature Order Form. 4. Cut & Paste the Literature Order Form, or save it and send it as an attachment to me at webmaster@chamberstoves.net (you can also just send me an email and give me a list of what you want). 5. I will reply with your total, and instructions as to how to proceed. 6. Once I receive your payment, your literature will be sent out to the address you gave! Please allow 2 weeks for delivery (faster shipping available - ask about my rush shipping service). 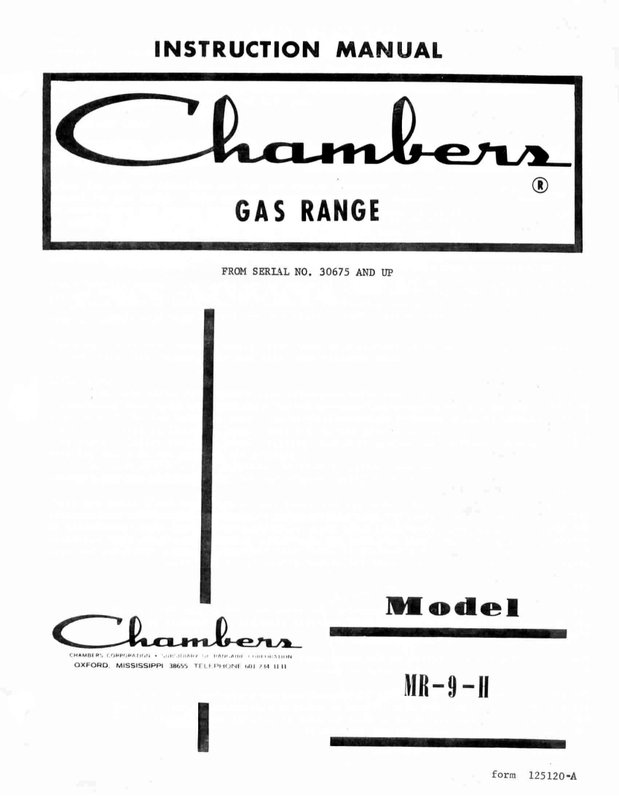 I have spent the last six years looking for pictures and original literature for the different models of CHAMBERS products. All of the literature I offer here is provided as a service to Chambers owners. With the exception of one, all are high-quality copies of actual originals published by CHAMBERS. In addition, these are not poor scans or pirated copies - permission of the copyright owner was obtained before I ever started producing them, and it remains so unto this day. You may wonder why you should pay for literature when you might be able to get it for less or for free from someone else. 1. With the exception of one, these are high-quality copies of originals, not copies of copies. I expect to have original for the other one shortly. 2. These copies are produced with the permission of the copyright owner. 3. The pricing on these products is modest - it covers the cost of printing, plus provides a small amount to help offset my cost in making them, plus the time and money it takes to maintain this website and the Chambers Rangers Discussion Forum. I'm not getting rich here, folks - just trying to cover my costs for providing these services. 4. I spend a LOT of time answering e-mail's, personal messages, questions on the Rangers Forum, and in personal telephone calls in order to help people get the most out of their CHAMBERS range. The money people pay for the purchase of literature I sell here helps offset that. I hope this helps you understand why I have to charge for these products, and will not be offended by it. If you are, please let me know, and I will send you whatever you need for free. * The "Idle Hour" Cookbook, Third Edition - Actually an Owner's Manual/Cookbook, this went through several revisions. You'll want the last one, which was published by Chambers after it was moved to Oxford, Mississippi. 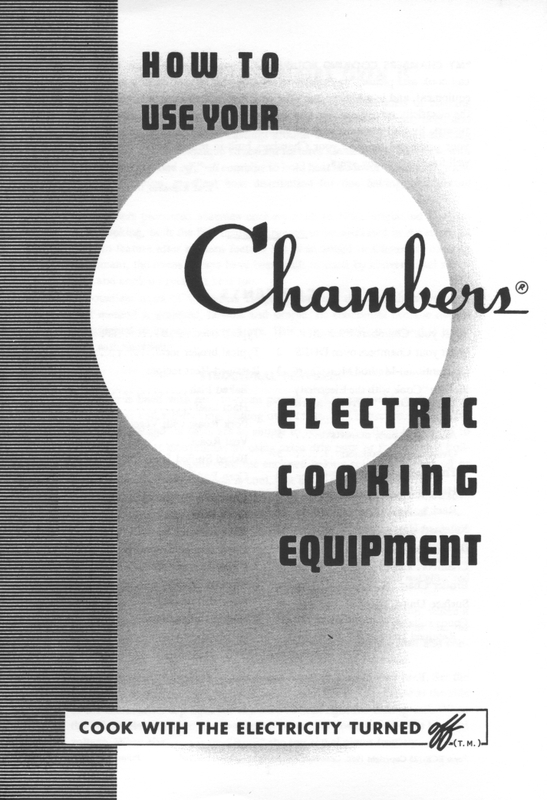 The largest and most informative of all of the Chambers cookbooks, this has a large number of recipes, and can also be used with ANY Chambers Range, including the Model "B", Model "BZ", and those that are equipped with an Oven Heat Control. * SIX Chapters - 80 pages - Covering use of the OVEN, THERMOWELL, BROILER, GRIDDLE, MENUS, & THERMOBAKER! > When To Sear On Top Burner. > When To Add Vegetables. 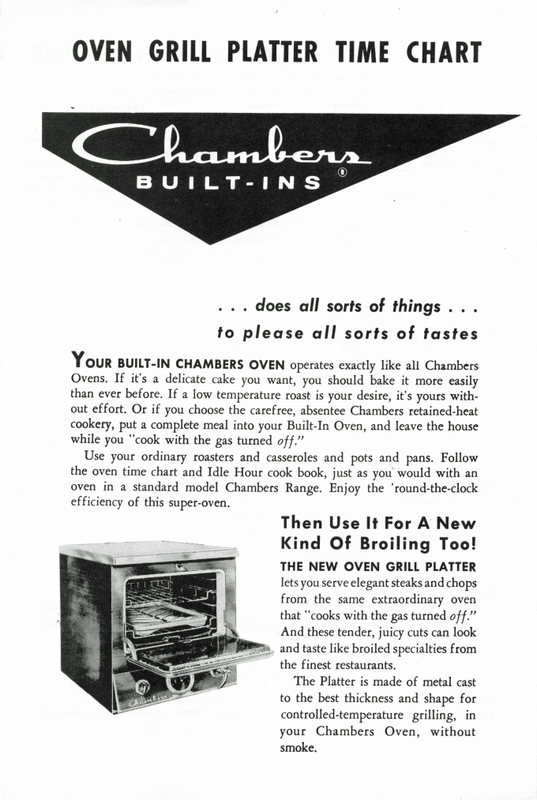 > Miscellaneous Facts About Chambers "Oven" Cookery. > How To Use The Oven To Cook Beef, Pork, Lamb, Veal, Poultry, Fish, Vegetables, Desserts, and Pastries With The Gas Turned off! 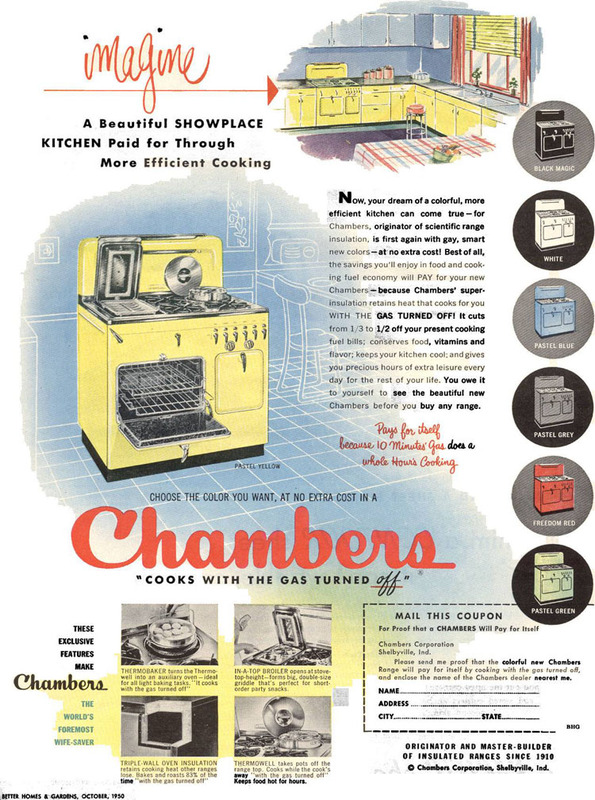 > How To Cook in the fabulous Chambers THERMOWELL With The Gas Turned off! This INCLUDES The Procedure For Making ICE CREAM In The THERMOWELL! 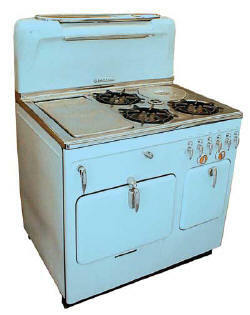 > How To Cook Beef, Pork, Lamb, Seafood, Vegetables, French Toast, & Sandwiches Using The In-A-Top Broiler and Griddle! 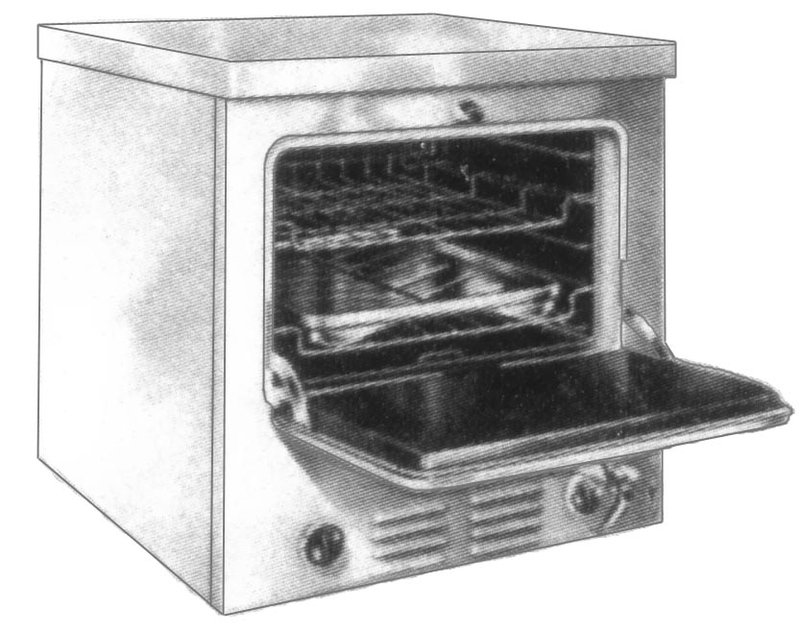 > How To Use The Patented Chambers THERMOBAKER To Cook Biscuits, Rolls, Quick Breads, Cakes, Pies, Baked Potatoes, Beef, Pork, Poultry, and Vegetables By Cooking With The Gas Turned off! > How To Care For You Chambers Range. There are lots of other recipe booklets, cookbooks, etc., that CHAMBERS printed over the years to go with the Idle Hour Cookbook, but they are of no real use if you don't have the cookbook itself. Actually an Owner's Manual/Cookbook, it contains so very much on how to use the exclusive CHAMBERS features to their full potential. 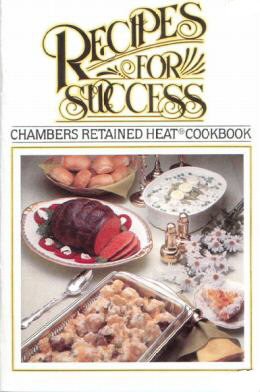 If you don't have the cookbook, start there, then add to your stash of CHAMBERS recipes, instructions, etc., as you feel you need to. * KITCHEN Size - Our exclusive creation, this is the same exact cookbook inside as the small (original) size, but with a BIG difference! The cleaned up original has been blown up to 8 1/2" x 11" size and bound in an easy to use spiral binder with clear plastic covers. It is much easier to use than the small one, because you don't have to hold it open while attempting to cook at the same time. The larger print makes it MUCH easier to read, too! Bound. B-series COOKBOOK- a professionally printed and bound copy of the first edition of the Idle Hour Cookbook. Great addition to your collection if you're a "B" owner! Bound. 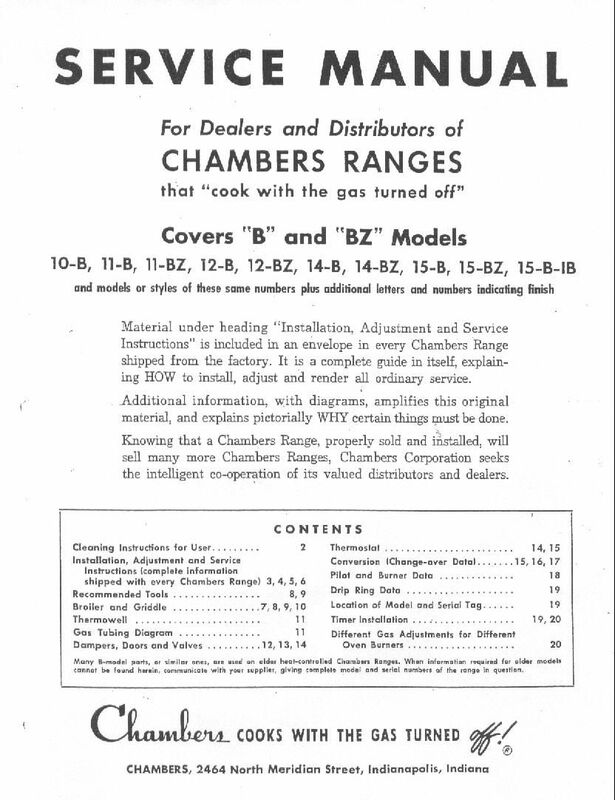 B/BZ-Series SERVICE MANUAL - in addition to the cookbook, the Service Manual is a "MUST HAVE" for the owner of CHAMBERS B-series range! Shows you how to assemble, calibrate, and service your CHAMBERS. No owner of a CHAMBERS B or BZ-series range should be without one! Included with the Service Manual is the Installation Guide and Illustrated Parts List, which most places charge extra for, at no extra charge - what a bargain! Bound. B-series OVEN COOKING CHART - If you don't have the cookbook, you will need this (some people want one to post by their CHAMBERS so they don't have to consult the cookbook all of the time). It tells you how to "cook with the gas turned off." Printed on card stock. Laminated. Canning Guide - This information is NOT found in any of the cookbooks we have seen to date. It shows how to use the CHAMBERS oven to can foods. Completely digitized, cleaned up, and reprinted from an original, this is a MUST HAVE item for Chambers collectors! Nicely printed on heavy paper stock. "Menu's Of The Month" - NOW IN COLOR! 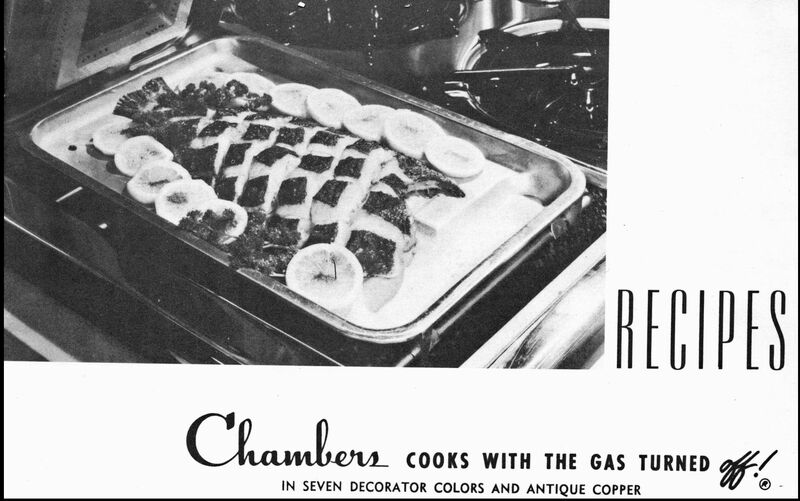 Originally sent out to CHAMBERS owners monthly over a period of 12 consecutive months, this booklet contains special information, menu's, tips, and recipes for each month of the year, INCLUDING HOW TO COOK YOUR THANKSGIVING TURKEY WITH THE GAS TURNED OFF! Not a poorly scanned black-and-white copy. Identical to the original, down to the color front pages for each month - not a bad scan of a poor black-and-white photocopy. Bound with clear protective front and back covers. C-SERIES SERVICE MANUAL, Revised Edition - in addition to the cookbook, the Service Manual is a "MUST HAVE" for the owner of CHAMBERS C-series range! Shows how to assemble, calibrate, and service your CHAMBERS. No owner of a CHAMBERS C-series range should be without one! This REVISED EDITION of the Service Manual is for EVERY C-model, not just the early or later versions! We've taken the best of both of the original manuals, arranged them logically for ease of use, re-scanned the pictures, re-typset the entire text in easy-to-read type, and added helpful comments, notes, and hints that make it the most comprehensive Service Manual for the CHAMBERS C-series of ranges available anywhere, at any price! This newly-edited REVISED EDITION of the C-series Service Manual is a compilation of the two earlier versions published by the Chambers Corp., and includes lots of new notes, comments, and suggestions for modern users of these vintage appliances. * New scans of the original photographs and illustrations. * Completely new text blocks added to most illustrations. * A totally new layout - you can now find everything about a particular part or area of your CHAMBERS in one spot. No more digging through multiple pages to find out what you need - it's all cataloged and arranged alphabetically for easy use! * Additional notes and comments, including a totally new section mixer pins, pin points, and gas type conversion! In addition to all of these new features, the REVISED EDITION of the C-series Service Manual includes the Installation Instructions - including how to calibrate the burners and oven thermostat. Why pay $40.00 for a pasted together, third-generation COPY of two old, outdated service manuals for your Model C? Get the most thorough, easy-to-use, and up-to-date service manual for your CHAMBERS C-series range available! Bound. C-series OVEN COOKING CHART - If you don't have the cookbook, you will need this (some people want one to post by their CHAMBERS so they don't have to consult the cookbook all of the time). It tells you how to "cook with the gas turned off." Now completely digitally re-typeset. Printed on card stock. Laminated. 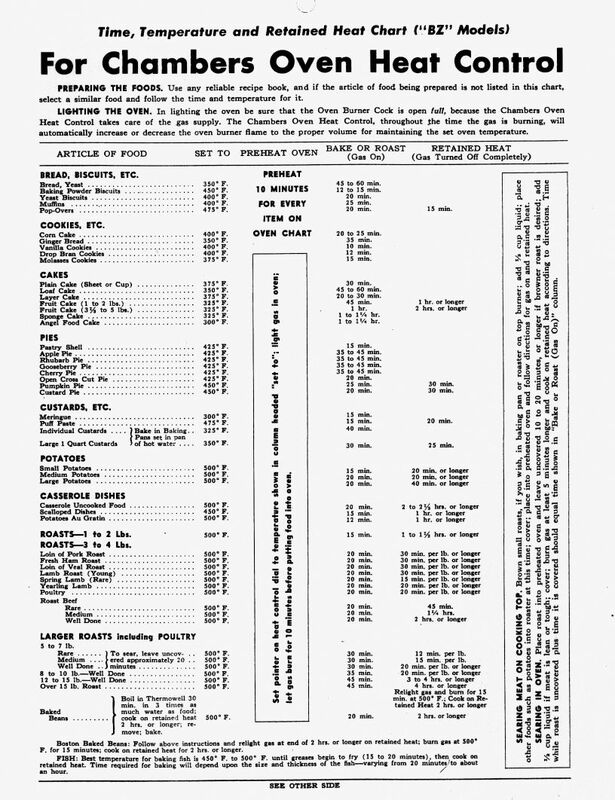 ThermoBaker Recipe Chart - This flyer was used to announce the new Thermobaker for the C-series ranges. It shows you how to use the patented CHAMBERS ThermoBaker to turn the ThermoWell into a second oven! Includes recipes on back. Made from a NEWLY SCANNED MINT ORIGINAL, then digitally cleaned up and nicely printed in COLOR (not a bad scan or a black-&-white multi-generation) copy of the original on card stock and laminated. "Cooking With The Gas Turned Off" Recipe Booklet - A VERY nice recipe booklet that has recipes showing how to use the CHAMBERS super-insulated oven to cook all manner of desserts, vegetable dishes, and main course meals with the gas turned OFF! 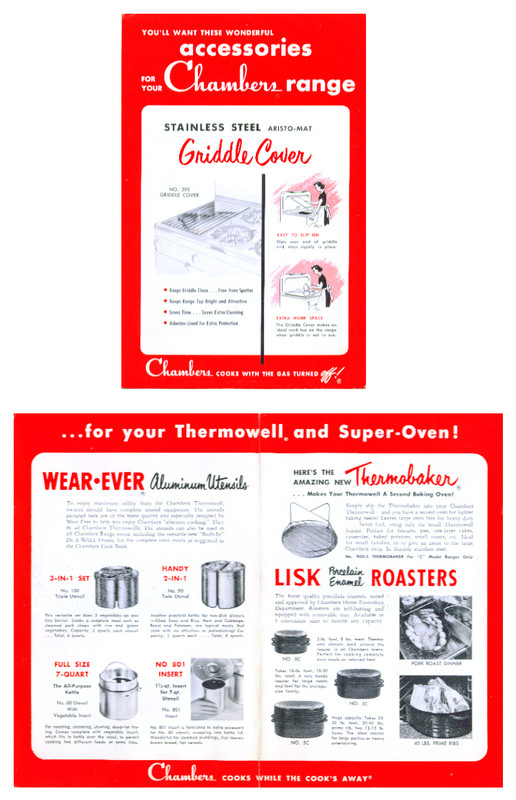 Includes a large assortment of recipes for the ThermoWell and ThermoBaker! Lots of pictures, too! Bound. Cooking School Programs & Menu's - Very rare. You get not one, but TWO different documents! 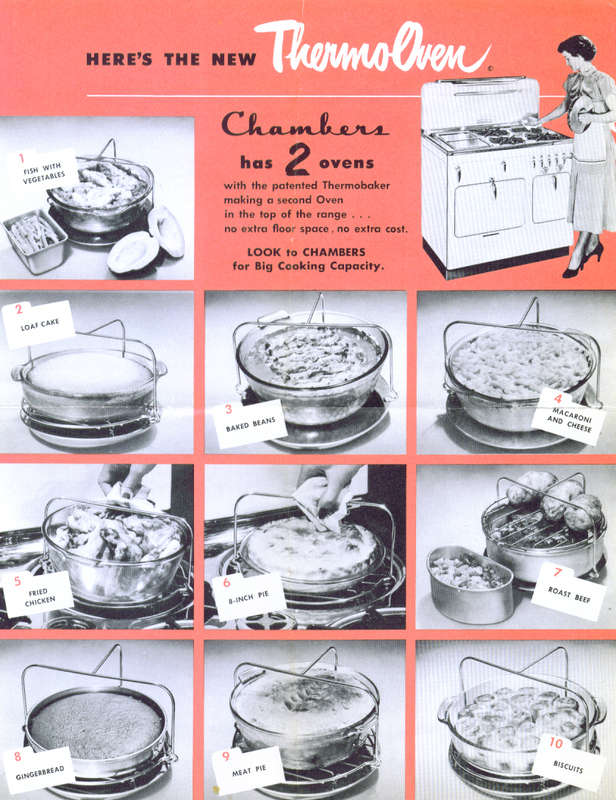 The first, pictured here, was distributed at the world premier of the C-series CHAMBERS range on October 6-7, 1949, and taught by Miss Alma Chambers herself! 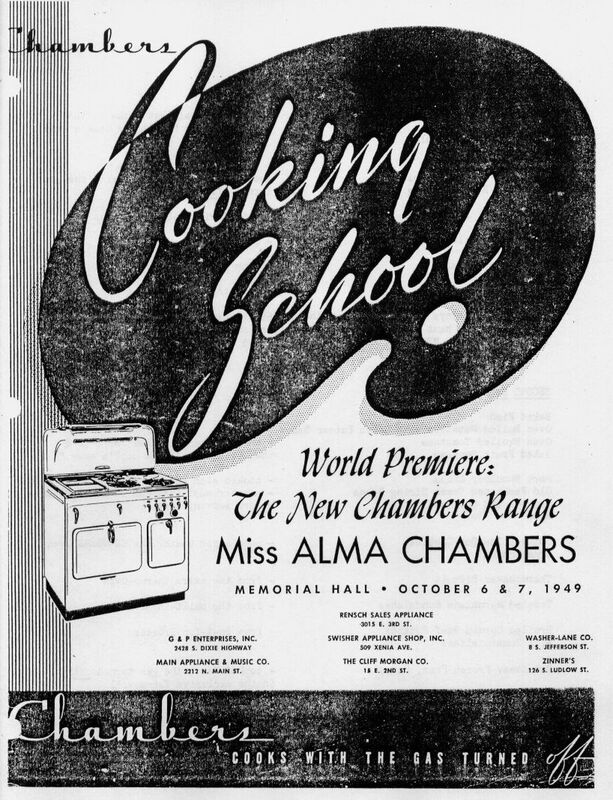 It is a copy of a copy of the original program (no longer extant) is filled with the recipes Miss Chambers used to demonstrate the NEW Chambers Range! 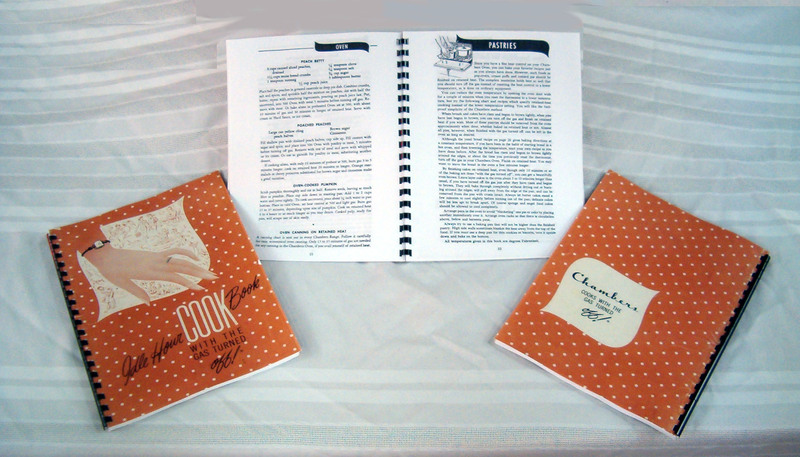 The second piece is a direct copy of an original distributed at the cooking schools - it is a large, 7-page document (including the covers) which has recipies, instructions, and PICTURES! Photocopied on nice paper. "Burner With A Brain" Instructions & Cooking Suggestions - Actually two items for one price, this is for owners of "C"-series CHAMBERS ranges that are equipped with an automatic top burner. 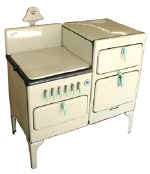 The Robertshaw Model FA Gas ThermalEye was an option sold by CHAMBERS as "The Burner With A Brain". The instruction booklet. left, gives excellent information on how to cook various dishes using the ThermalEye. The other document, right, gives details on operation and service of this control. If you have a "Burner With A Brain", you NEED these! Excellent copies on heavy paper stock. "Accessories For Your Chambers Range" Flyer - For owners of "C"-series CHAMBERS ranges, this flyer shows all of the neat accessories you could get for your range, including the Griddle Cover, Thermowell Kettles, the Thermobaker, Lisk Roasters, Oven Grill Platter, Broiler Serving Rack, and Broiler Platter Lifter. A high quality COLOR copy of a rare original on heavy paper stock. "Imagine" Color Magazine Ad, from Better Homes and Gardens, October, 1950 - Beautifully reproduced COLOR copy on heavy card stock of a really cool looking advertisement for the color C-series CHAMBERS ranges. A nice addition to your CHAMBERS collection. Oven Grill Platter Time Chart - For owners of the famous In-A-Wall Gas Oven by Chambers, this fold-out cooking chart, similar to the ones for the Oven and Thermowell on free-standing models, details how to use, care for, and cook with this exciting, and yes, rare, Chambers accessory, The Chambers Oven Platter. It also gives instructions on how to adapt Thermowell recipes to the Oven! A high quality copy of a rare original on heavy paper stock. Following the C-series was the Model MR-9-H, commonly called a "Model D". 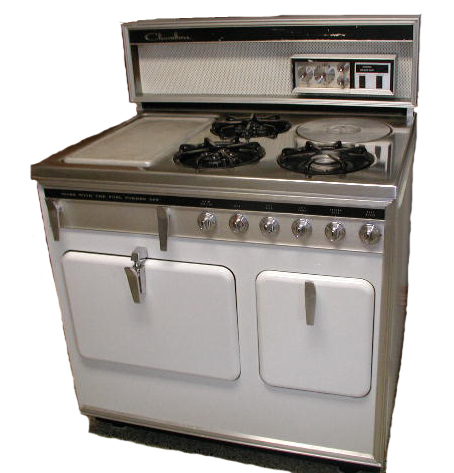 This model, which was manufactured in the recently relocated Chambers factory in Oxford, Mississippi, retained all of the mechanical features of the later C-series, but with a cosmetic facelift, standing pilots for all burners, and an electric timer operation system. A very helpful and rare piece of CHAMBERS literature. You won't find it anywhere else! High-quality copy of an original. Bound. 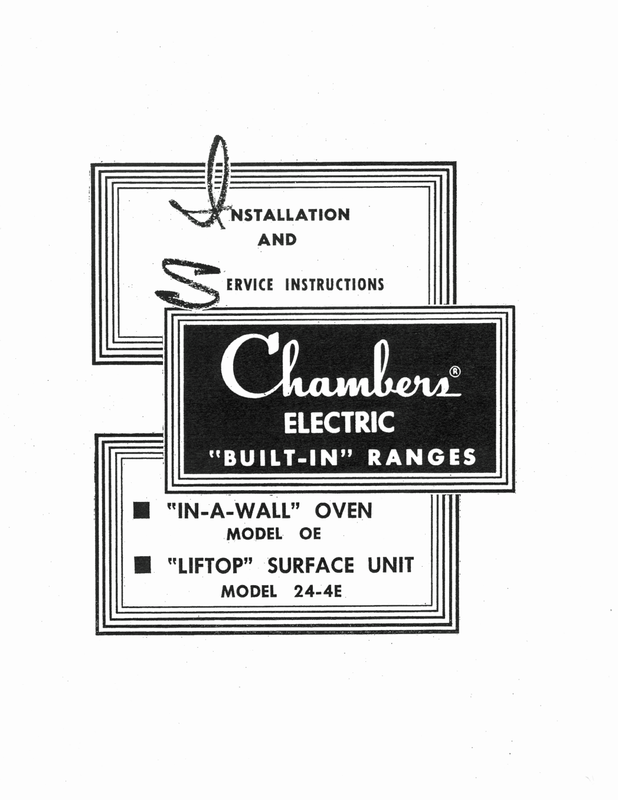 "Directions For Installing And Using Chambers Ranges" - There are two editions of this booklet, sold for one price. One is earlier, and has some helpful setup and calibration information for this era of CHAMBERS ranges not found in the later one. The second is a later edition. 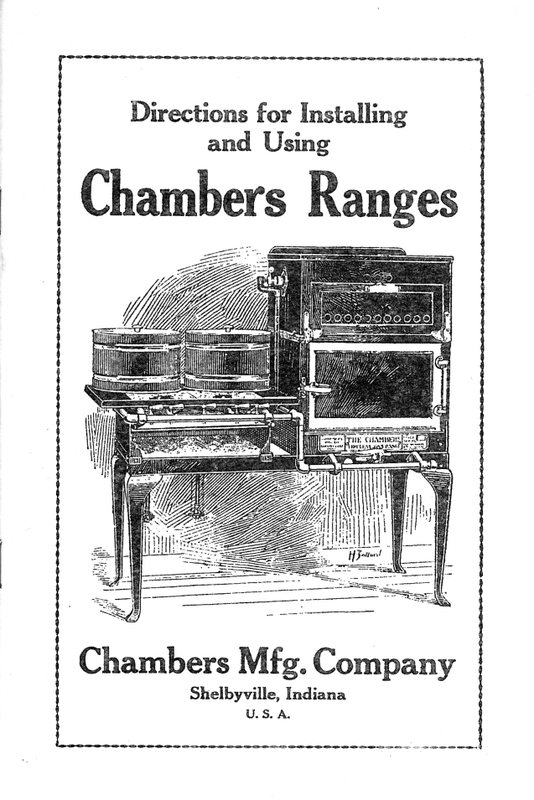 Both are nice copies of very old instruction manual/cookbooks for the earlier model CHAMBERS "Fireless" gas ranges. 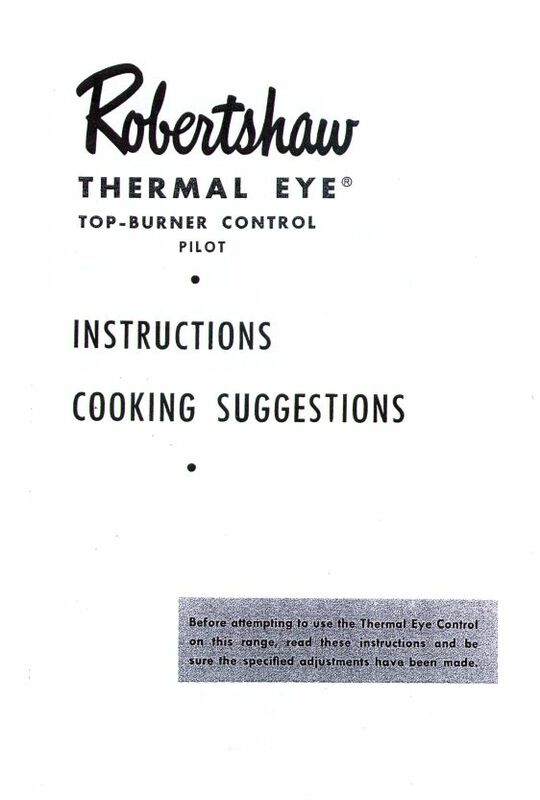 A precursor to the "Idle Hour Cookbook", this contains information on how to use these earlier models, including nearly lost instructions on how to operate the patented ThermoDome (predecessor to the ThermoWell). Twenty pages, illustrated, printed and bound. 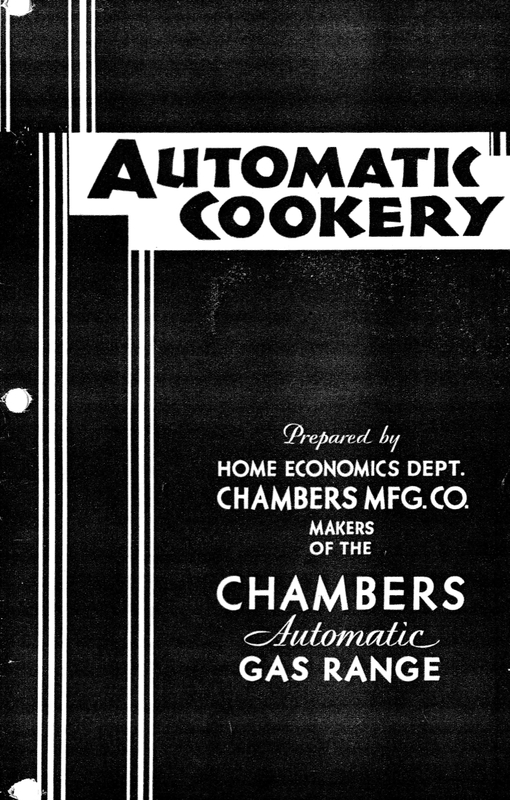 "Automatic Cookery" - For ranges preceding the "A" through "C" series. Has a LOT more recipes and a more refined oven cooking chart. 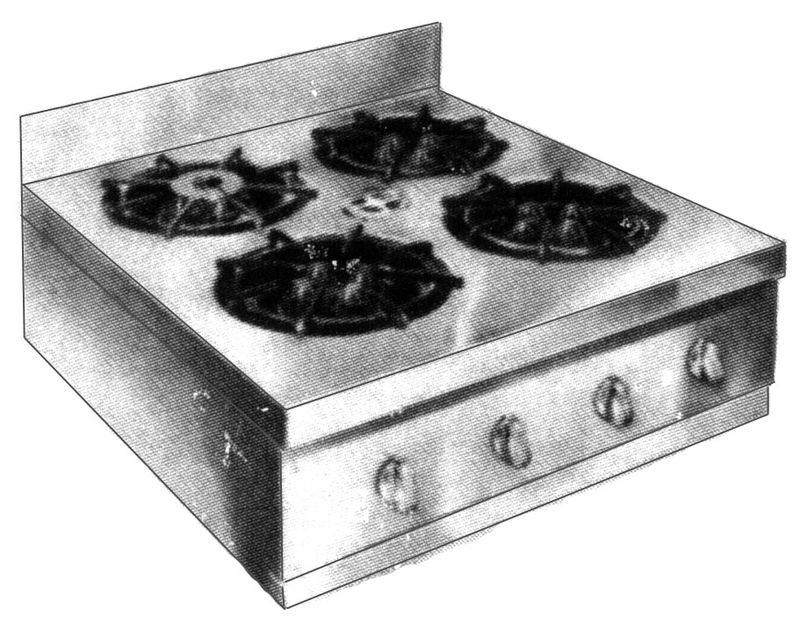 Includes information on how to use these earlier models (also has pictures of them with model numbers), including instructions on how to operate the patented ThermoDome (predecessor to the ThermoWell) and the "new" kettles for it, and the newer oven control, the "AutoStat". Twenty-eight pages, illustrated, printed and bound. 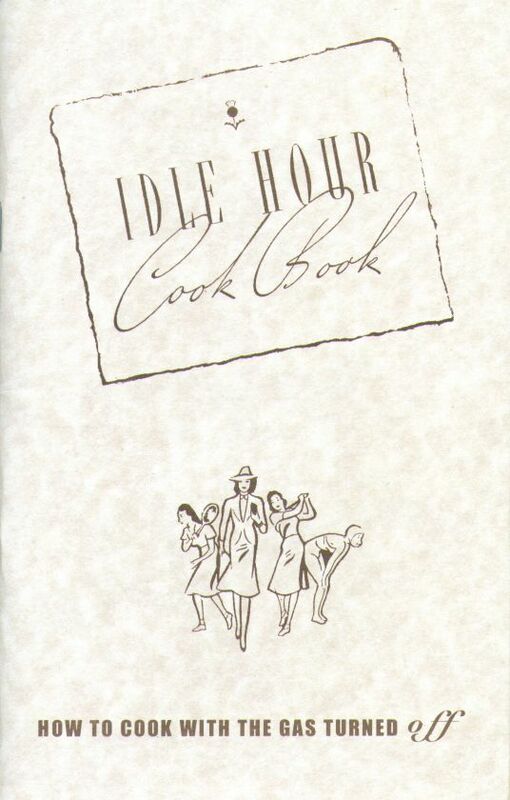 "Idle Hour" Cookbook, First Edition - This high-quality copy of an original, first edition of the "Idle Hour" Cookbook, published in 1927, is very interesting. It covers the Chambers Ranges before the A through C series, and has interesting testimonials from CHAMBERS users, including Dr. Lee DeForest, proper place settings, and excellent information on how to use the ThermoDOME! Illustrated, printed and bound. 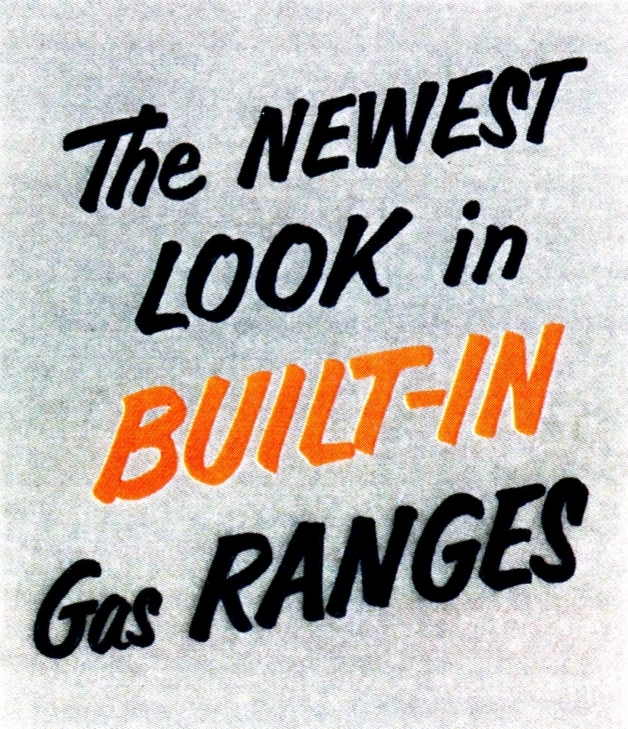 COLOR SALES BROCHURE - Contains a complete listing of all of the CHAMBERS gas built-in's! Gives model numbers, weight, dimensions, and ideas for installation. A MUST for the serious CHAMBERS owner! Color, printed on heavy paper. 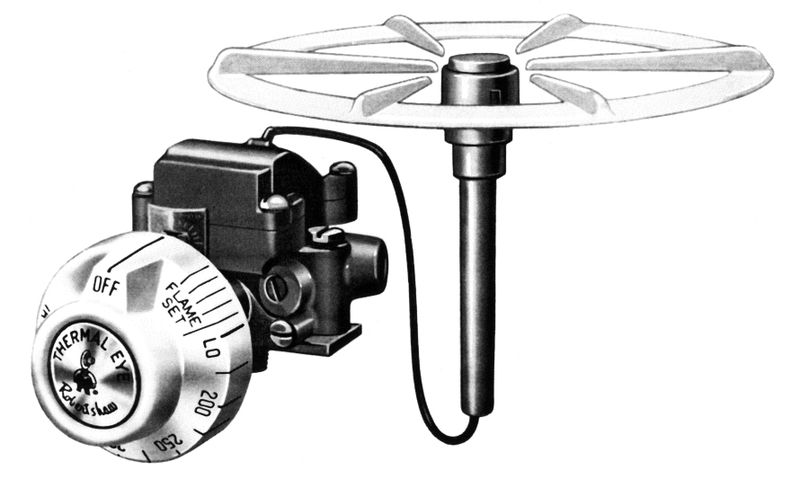 INSTRUCTION MANUAL & PARTS LIST FOR GAS SURFACE UNITS - Contains calibration instructions, a complete illustrated parts list with part numbers, and installation instructions for new or existing construction. Printed on high quality copy on heavy paper. INSTRUCTION MANUAL & SERVICE INSTRUCTIONS FOR ELECTRIC "BUILT-IN" UNITS - Contains instructions on proper operation, calibration, cleaning and care of ELECTRIC units, and includes wiring diagrams and installation instructions for new or existing construction. "HOW TO USE YOUR CHAMBERS ELECTRIC COOKING EQUIPMENT" - Contains everything you need to know about using the CHAMBERS electric built-in's! 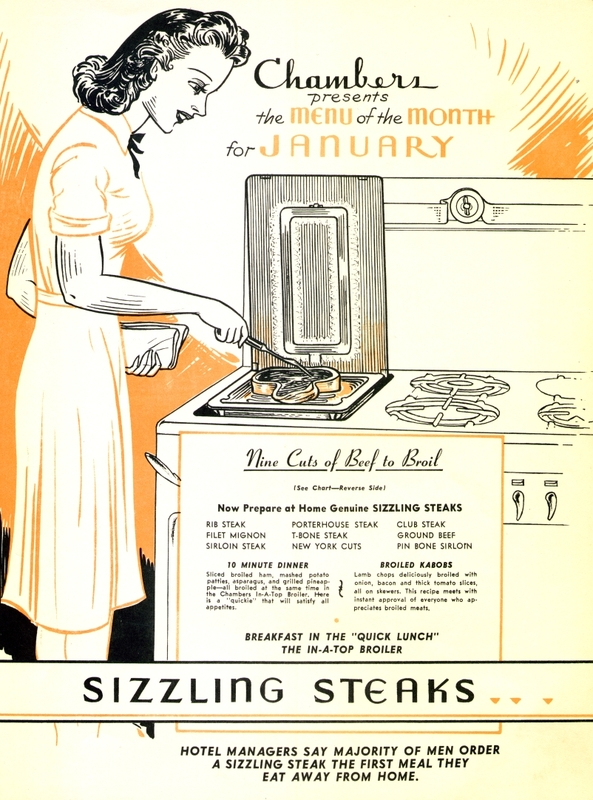 Includes heretofore unfound Oven & Broiler Cooking Charts, recipes, and much, much more. Copy of an original. Printed on high-quality paper and bound. 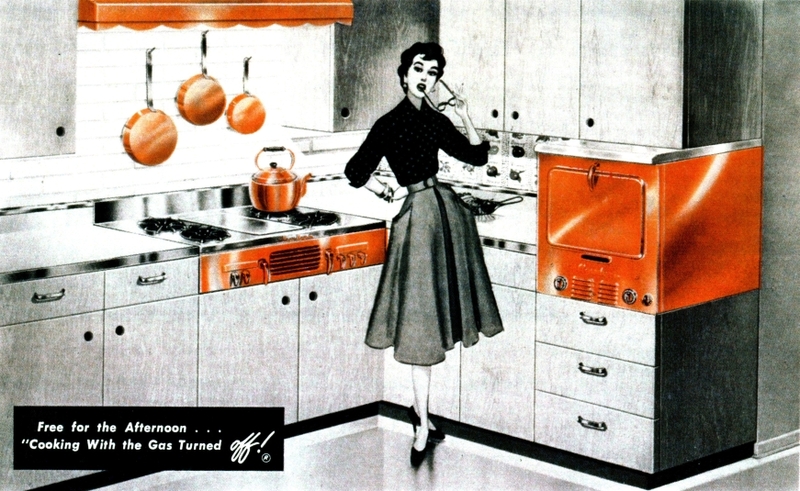 RECIPE BOOK FOR LAST VERSION OF THE INSULATED CHAMBERS OVEN & COOKTOP - A nice, albeit too late, attempt by the folks at KitchenAid/Chambers to make a new cookbook for the last version of the insulated ovens and cooktops. Nicely done, but nowhere nearly as thorough or informative as the "Idle Hour" Cookbook. Helpful to owners of this model, though. Softbound. Color. Quite Simply, The Chambers Stoves Are The Best That Have Ever Been Made By Anyone, Anywhere, Anytime! In Order To Realize The Full Potential Of This Marvelous Kitchen Appliance, You Have To Know How To Use It, And In Order To Know How To Use It, You Really MUST Have A Copy Of "The Idle Hour Cookbook!" 1. Pricing for postage is calculated by PayPal. 5. Pricing for packaging and postage for 13 or more items is FREE!